You’ll find a lot of people out there ready to give you advice on your presentation or pitch. Sadly, you can’t always trust them. I don’t mean that in a snooty way. It’s just that when it comes to public speaking, bad advice abounds! Take it from me, as a keynote speaker, I encounter a lot of well-meaning folks who think they have good ideas about presenting, but it turns out they’re a little misguided. In this post, I’d like to quickly highlight some of the subpar speaking advice you might run into—and tell you why it’s best avoided! You’ve got to use a PowerPoint presentation. Now, I’m not opposed to using visuals in your presentation. I sometimes use them myself! But tying yourself to a PowerPoint can sometimes be dangerous—especially if you wind up just reading your slides. Don’t feel like you have to use a PowerPoint. And if you do, pick slides that underline emotions and hammer home key connections. Don’t just read text from the screen. You’ve got to use a lectern/podium. Again, these tools aren’t bad, especially not if they help you feel more comfortable and stay better organized. For speakers like me who like to move around and really engage the audience, though, podiums can really get in the way—so again, don’t feel like you have to use one. You’ve got to start with a joke. Yes, humor can definitely enliven your presentation. But let’s get real: not everyone is born to be funny—and trying to force a joke that’s not really amusing can make your presentation feel awkward from the get-go. My recommendation: use jokes only when they come naturally, and only if you’ve tested them on people and found them effective. You should make people save their questions for the end. If you’re giving a keynote address to a large audience, this can actually be helpful advice. But if you’re giving a sales pitch in a smaller setting, it may be wise to field questions as people think of them—before they forget, lose interest, or begin to feel frustrated. 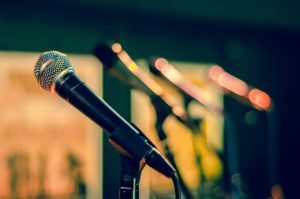 Those are just a few of the most common pieces of bad public speaking advice that I hear. If you’re looking to hire a motivational speaker who knows how to engage, connect, and inspire, give me a call today! You can contact me at www.rickgoodman.com or call 888-267-6098. What is a solutions-oriented leader? Take the free Solutions-Oriented Leader Assessment now and claim your Comprehensive Guide to Achieve Success. 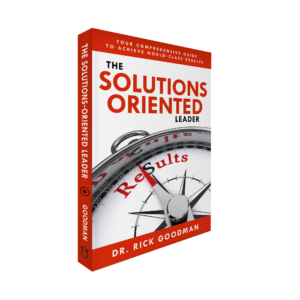 Dr. Rick Goodman’s Solutions-Oriented Leader book is now available to order online. In this first-of-a-kind, comprehensive guide, author Dr. Rick Goodman leads you through the everyday challenges of the modern workplace while providing you with easy-to-implement solutions to achieve world-class results!